Escallonia are a low to medium growing evergreen flowering shrub with masses of flowers in spring through summer. Easily clipped into a hedge they prefer a well drained spot in full sun to part shade. Escallonia do well in pots. These are excellent hedging plants in full sun,however not so great for shade. The dwarf varieties are very popular, reach around 80cm in height they come in a range of flower colors and are an easy care low plant for the border or for a low hedge. Generally tough plants that cope well with low water and coastal conditions including poor soil. They will do better with a little water and fertilizer as do most plants. Regarded as problem free and easily pruned to keep in shape. When planting as a hedge, space Escallonia at around 1m – 1.3m apart for a good dense hedge. Generally they are best pruned to 2m or less in height. Prune Escallonia after flowering, and again in autumn. Escallonias can be cut back into old wood and will regenerate. They also attract butterflies and bees. E. iveyi with its dark glossy green foliage, it is a hybrid with panicles of white terminal flowers will reach around 2m in height is one of the more popular forms. E. rubra with its rosy pink flowers is another worth considering. Escallonia x langleyensis ‘Red Knight’ – Attractive red flowers on a small shrub to 3 metres in height. E. Pink Pixi – Low growing form with pink flowers from spring though summer. Excellent as a low hedging plant. 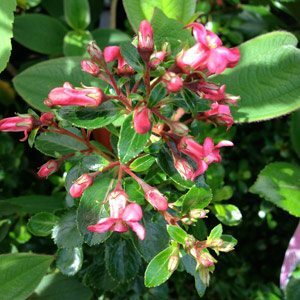 E. Newport Dwarf – Pink flowers on a low growing bush to around 80 cm to 120 cm. Excellent as a low hedge along the edge of a driveway, path or used as a border plant. As a drought tolerant easy care hedge, Escallonia make a great choice. Low growing varieties can be used as a border along a path. Taller types are suited as hedging or screening plants. Flowers are long lasting from spring through summer and vary in colour from white through to pink and red. Flowering Time – Spring to early summer on into autumn depending on conditions. Fragrance – Yes, flowers are fragrant. Drought tolerance – Medium to good once established.